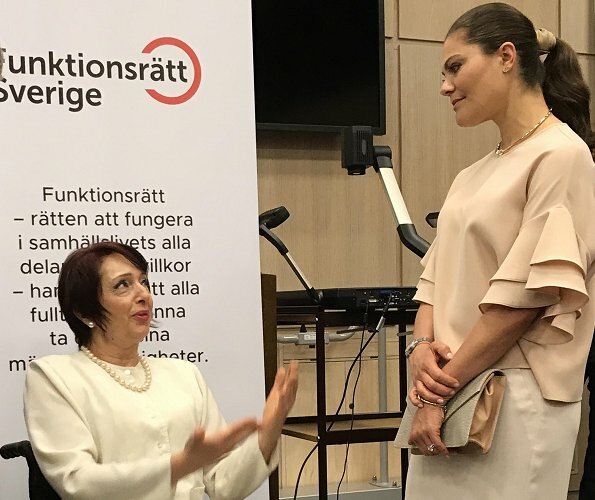 Crown Princess Victoria of Sweden attended the celebration of 75th anniversary of establishment of the Swedish Disability Federation (Handikappförbundens) at Stockholm County Council building (Landstingshuset) in Stockholm on May 19, 2017. 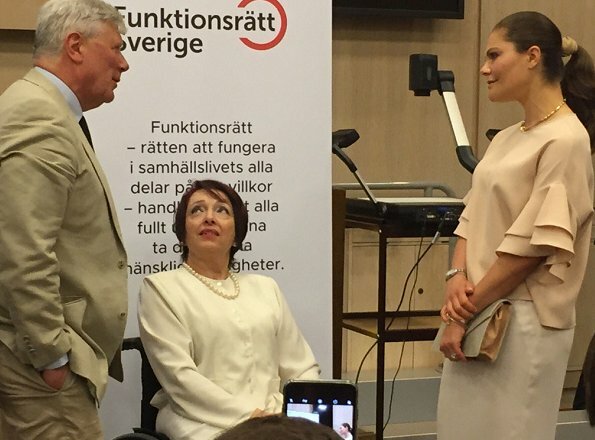 The Swedish Disability Federation was founded 1942. Love this one! Boxy, feminine, and on trend. Her smile is her best accessory but I adore the accordian clutch! 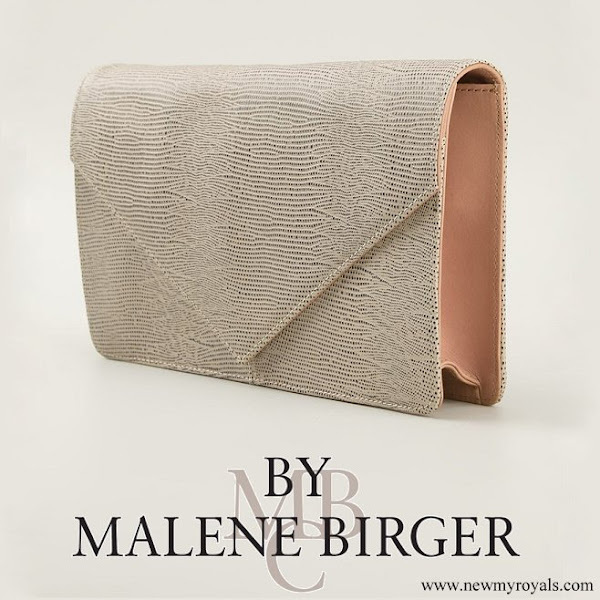 Lovely - nice cool spring neutrals, lovely tailoring - she looks great. I really like the top. This is the best of CP Victoria!! Very chic, including the hair, SUPERB!! Love this! I'm not a fan of fussy sleeves but these really work. And the vanilla ice cream colours are so nice for spring. Very soft and feminine outfit. Great combo of business-like yet pretty. Pretty! Great for a meeting, professional yet feminine. I'd prefer the top was a bit more fitted, but with the skirt I think it balances out. Her hair is still pulled too tight, but at least no bun! YAY. Not crazy about the top but she looks good and happy. Hair: i think she has a complex, wich complex i don t know, but i am sure it is a complex for her face, herr chin i think. Maybe but then the bun is the worst way..it puts in evidence all the features of her face. Strange that no hairdresser has ever told her.Probably she just prefer herself like this. I think she doesn't like her hair in her face and that's a practical and tidy solution. I expect she usually does it herself so it's probably easier to pull it tight to ensure it stays in place. When she has a softer, more flattering look it's clear that the professionals have been helping. Franny I think you are right. I have myself long hair and I just hate the feeling loose sweaty hair is glued to my face, it is so disturbing that if I am for example driving a car hair loose I have to stop and tie them. So I keep my hair always tied. I have long thought Victoria feels the same, hates hair to her face. Also that is true that Victoria makes her hair to average situation herself, she has hair dressers at work only mostly to her gala look. Her regular bun is very easy to make. Victoria should never go for such a severe hair, it does not suit her face shape at all! She needs more volume on her head to better balance her chin. Her sister, Madeleine has also pointed chin but she's better at balancing it. And how you can always wear your hair tied back like this? Don't you get e.g. tension headache? Even when you tie your hair back loosely, your poor scalp and hair are under constant tension, and you can not avoid pulling at the roots. So you will end up with receding hairline, you wonder why there are so many baby fine hair around your hairline. So its good to switch styles and let hair just rest. I admit this kind of hairstyles looks professional but regrettably this style brings unwanted attention to her big chin. So I only see her scarily big jaw! Like Marianne said she should never go for such a severe hair! She needs something softer, more volume on her head.